This photo story was submitted to us by Susan Clay in the hope that we humans would learn to live in the innocent peace of this fawn and rabbit, Fienchen and Thumber. We graciously thank Tanja Askani for her sensitivity in taking these photos, for they are another example to the human race that we can have peace on earth, if we learn to stop our warring madness against our fellow humans, the other animals, and the environment in which we all live. Tanja Askani's web site is: http://www.Tanja-Askani.de. Unfortunately it is only in German. 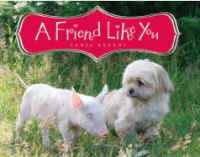 Tanja is so glad that she finished her first and brand-new little children's book, A Friend Like You. Fienchen and Thumber (the fawn and the wild rabbit) are also part of this little book. It is available at a discount from Amazon.Com.